Honey is an excellent source of energy, as well as an effective antiseptic, that requires little human and fuel energy to produce. Unlike maple syrup, it requires no processing once harvesting. One hive can produce around 30 lbs of honey per year, enough for about 5 adult males. Although bee hives can be made out of anything hollow, building a standard box hive makes it possible to harvest the honey without needing to destroy the structure. The hive consists of open boxes called supers (from superhives) in which the frames are hung. As bee populations grow and more room is needed, extra supers are stacked on top, building upwards. As bees feed on forage plants and flowers, select a location within a 1-2km radius of plants. Bees like alfalfa, clover, dandelion and sage blossoms. In setting up, prevent mold and disease from a damp environment by placing the hive in a spot with good drainage, such as on a gentle slope. Avoid hollows or low spots where water can collect. It can help to raise the hive above the ground on bricks as well. The hive should be sheltered from wind, as even a mild breeze can chill the bees. An effective windbreak for the winter months is important. At the same time, the hive requires enough sunlight to keep warm, maintaining a temperature of 34oC. In excessive heat, the hive needs shade to prevent overheating. Wear protective clothing when tending to bees. A broad-rimmed hat with wire veil will protect the head, face and neck. Light-coloured coveralls and long-sleeved shirt will protect from stings and not agitate bees. Wear loose-fitting gloves and stout boots to protect hands and feet. Equipment needed includes a smoker for quieting bees, a hive tool to pry open frames, and a large kitchen knife. To extract honey more effectively from the frames, you can build a centrifugal extractor to spin the frames within a metal drum to collect honey from the sides. Begin with a small swarm of bees either captured in the wild or acquired from one of the city’s existing apiaries. The queen bee should be in her own small cage box, lodged between frames near the top of the box. Remove a few frames from the box to allow bees to enter the hive. Pour the package of bees over the queen cake and the opening from the removed frames. Use a smoker to control bees by blowing smoke where you want them to move from. Also, late afternoon and early evening is when bees are most docile. Plants yield nectar in two main flows. The spring flow starts with the blossoming of dandelions and fruit trees and lasts into July. The fall flow begins around September and ends when hard frost kills the last flowers. Honey can be extracted after each flow, especially at the end of autumn. Honey can be extracted from the frames by letting it drip into a clean pan. 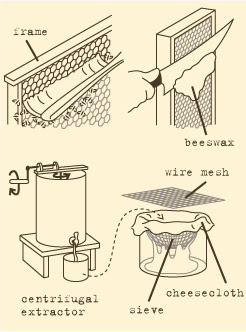 For greater efficiency, build a centrifugal extractor to spin the honey out of the frame (see diagram). Harvest honey from the frames on sunny, windless days. Drive the bees away from the honeycombs by blowing a few puffs of smoke through the hive. After a few minutes, pry loose the outer cover and then the inner cover using the hive tool or crowbar and lift it off. Use more smoke as needed. Gently pry a frame loose and remove carefully without crushing any bees. Gently brush off bees that cling to the frame. The comb is ready to be harvested if it is 80% sealed over. Take the frame to a tightly screened “room” and slice off the comb surfaces with a large, sharp kitchen knife that’s been pre-warmed in hot water. Place the frame in a pan for dripping, or use in a centrifugal extractor. Newly extracted honey must be strained through cheesecloth to remove wax and impurities. Let the strained honey stand several days. Scrape off the air bubbles that will rise to the surface. Pour the honey into clean, dry containers with tight seals, such as mason jars. Store honey in a warm, dry room. To prevent fermentation and slow crystallization, heat the honey to 60oC in a water bath before bottling it. Check temperature with a thermometer to prevent overheating. Note however that raw, unpasteurized honey has enormous health benefits but will crystallize in time. Crystallized honey can be liquefied by heating the jar in warm water and stirring. Over the winter, cold and lack of food can kill the bees. Leave one deep super filled with honey and polled for the bees. Supplement with syrup as needed when checking the feeder regularly. Open a 1-inch hole in the top of the super for ventilation. Wrap the hive in a layer of tar paper, fastened with tacks or staples. Leave a vent hole, stapling wire mesh over the opening and vent holes to keep mice out of the hives over the winter. Sadly this doesn't take into account the two major diseases that kill honey bees today: American foul brood and European foul brood. If you don't address Varroa Mites & Tracheal Mites you're missing another potential fatality to your colonies. I know you can't cover everything, but at least the basic dangers seems like a minimum. 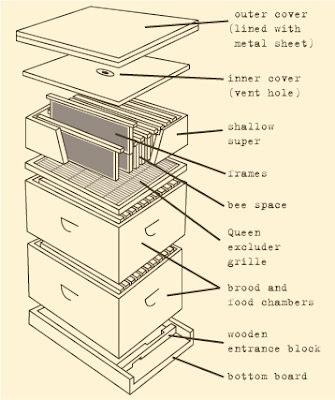 I love the schematics of the beehives that you have used. If its alright with you I'd like to borrow them (and leave links and credit to your blog of course) for my Dad's new beekeeping blog. Campbell's Honey OnSugar does actually take American Foulbrood and European Foulbrood into consideration and blogs with some authority on the subject of mites and moths. I have been thinking of building a home for a couple of bee colonies on my property ... http://www.biobees.com/ seems to be something I would like to try ... I like what the author has to say.